Frankie Frisch, the 35-year-old manager and second baseman of the 1934 St. Louis Cardinals, was an infielder for 19 years, spent 16 years managing NL teams, and put in some time as a broadcaster, all in the National League. His playing and managing exploits won him election to the Hall of Fame. Frank Francis Frisch was born in the Bronx, NY, on September 9, 1898,1 to Franz and Katherine (Stahl) Frisch. Franz Frisch was a prosperous lace-linen manufacturer who assumed that his son would enter the business after completing his college education. The elder Frisch apparently never imagined that his athletic son would find a completely different means of earning a living. But the independent-minded young man had other ideas. Frisch displayed his natural athleticism in Fordham Prep School and Fordham University, where he majored in chemistry. He was a track star (gaining the lifelong nickname "Fordham Flash") and captained the football, basketball, and baseball teams. In 1918 Frisch was named as a halfback on an All-American football team. The following year he was signed by the New York Giants baseball club, never having played in the minor leagues. Frisch worked out with the Giants in the spring of 1919, and joined the club after his college graduation in June. McGraw wanted to send him out for minor league schooling but Frisch talked McGraw into keeping him, citing pressure from his father to join the family firm if he were farmed out. And so McGraw worked intensively with the aggressive Frisch on all facets of his game. Frisch was a switch hitter who batted crosshanded from the right side; that is, when he hit righthanded, he kept his left hand above his right hand. McGraw worked with him each morning, teaching him fielding and sliding techniques and how to hold the bat properly. Frisch hit .226 while playing second and short in his first season, but improved to .280 as a third baseman in 1920. (He had played shortstop as a collegian, but McGraw decided that he did not have the sure hands or range to excel there). His breakthrough season came in 1921, when he had 211 hits, hit .341, and stole a league-leading 49 bases while splitting the year between second and third. He became a Giants stalwart as McGraw's club won the first of four consecutive pennants. As Bob Broeg described his play: "Frisch was tremendous, a whirling dervish of the diamond, knocking down hot smashes with his chest, diving for others that seemed out of reach, ranging far and wide for pop flies, pawing at the dirt to get a long lead and then stealing bases. "3 Frisch gave a solid performance as the Giants beat the Yankees in the 1921 World Series. He was the key player as the Giants won pennants in the following three seasons, averaging .335 and 196 hits over the three-year period while playing almost exclusively at second base. The energetic Frisch was a slashing switch-hitter who made up for his lack of home-run power with a steady barrage of clutch hits and stolen bases. Frisch was a more consistent hitter when batting lefthanded although he had more power righthanded. Hitting from the left side, he was an adroit bunter and, with his speed when he was young, he often drag-bunted for a base hit. He was especially skilled in punching outside pitches to left field. The extremely competitive Frisch became a favorite of McGraw, who saw in him a kindred soul, and Frisch was appointed team captain early in his playing career. There were no problems between the two while the Giants won pennants in the early '20s, despite the very rough McGraw, who traditionally was especially hard on the Giants' captains. But as the Giants' performance deteriorated and McGraw became more irritable and frustrated, he singled out his captain and verbally abused him in the clubhouse after difficult losses with words meant not so much for him as for other members of the team. Frisch bridled at the abuse but took it for the sake of the team. Frisch took a lot of verbal punishment when the Giants lost the pennant to the Pirates in 1925 and to the Cardinals the following year. By the end of 1926 he could no longer stand it. After an especially tough loss in St. Louis well into the season, and an especially cruel post-game McGraw diatribe, Frisch left the team and returned home to New York. He came back to finish the season, but his relations with McGraw were beyond healing. He was traded to the Cardinals after the season. It was a blockbuster deal, as the Giants gave up Frisch and pitcher Jimmy Ring for Cards' second baseman Rogers Hornsby. Hornsby, considered by many as the greatest righthand hitter ever, had just played and managed the Cardinals to a World Series championship win over the Yankees. The Cards made the trade because of owner Sam Breadon's irreconcilable differences with Hornsby. Hornsby, having just brought a championship to St. Louis, was a fan favorite. But Frisch, who called his new team the "Cawd'nals" in his New York accent, won over their fans with a brilliant season, hitting .337 with a league-leading 48 stolen bases, and setting a still-standing major league record for second basemen of 641 assists. Frisch was the indispensable spark club as the Cards narrowly missed winning the pennant, and he was the field leader as the Cardinals won pennants in three of the next four seasons. Frisch was voted the National League Most Valuable Player in 1931 as the Cardinals won the pennant. Frisch became the Cardinals player-manager midway through the 1933 season, his team finishing in fifth place. Shortly before taking over as manager, he played in the first All-Star game at Comiskey Park in Chicago. Batting righthanded in his first at-bat, Frisch singled. Later, hitting lefthanded, he became the first National Leaguer to hit a home run in the Classic. (He also homered off Lefty Gomez on the first pitch he saw in the 1934 All-Star game). Frisch's colorful 1934 club was a smashing success. It included such unforgettable characters as pitchers Dizzy and Paul Dean, the inimitable Pepper Martin at third base, Leo Durocher at short, and slugging leftfielder Joe "Ducky" Medwick. The loud but talented Dizzy Dean's unpredictable antics kept Frisch on constant edge. Martin, like Dizzy, was an uninhibited country boy whose zany activities did not detract from his spirited play. And Medwick was a tough New Jersey native with an extremely potent bat and an unusually low boiling point. A writer dubbed Frisch's club the "Gashouse Gang" when they appeared in badly soiled uniforms before a game, not having had time to have the uniforms cleaned. For much of the season, the Cardinals were barely within striking distance of the National League lead, but they came on strong in the last month to edge out the Giants for the pennant. They topped off the season with a tumultuous World Series win over the Detroit Tigers. Frisch was not immune from his players' hijinks just because he was the player-manager. One day in a Chicago hotel, Pepper Martin filled a paper sack with water and waited until Frisch came down the street under Martin's third floor room window. Pepper dropped his water bomb on his manager's head, then tore down to the lobby, picked up a newspaper, and sat down. The drenched Frisch stormed into the lobby, wringing wet. He walked over to Martin and said, "Damn you, if you weren't sitting there reading, I'd swear it was you that did it." Martin dropped his newspaper and inquired innocently, "Did what, Frank?" The 1935 club had a virtually identical won-lost record as in the previous year, but the Cubs surpassed the Cards with 21 consecutive wins late in the season. Frisch became recognized as a manager as intense as John McGraw. Terry Moore, a gifted outfielder who was a Cardinals rookie that season, remembered that spring training camp: "I think I have had one of the toughest managers on earth. Frisch didn't like rookies, and every time I made a mistake he'd always yell, 'Who was your manager? I wish he'd taught you better than that!' Frisch was tough on you." That spring rookie catcher Sam Narron asked Frisch how best to occupy himself. Frisch suggested that Narron pick out an established player and do everything the veteran did. A few days later Frisch was leaning against the batting cage watching his players hit. He noticed that Narron, who should have been practicing, was leaning against the other corner of the batting cage. "Hey," he yelled, "Sam, what the hell are you doing? I thought I told you to pick out a player and do what he did." Narron replied, "I did pick out a player, Mr. Frisch." The manager asked, "And who did you pick out?" The guileless rookie answered, "I picked out you, Mr. Frisch." The quick-witted Frisch responded, "Well, I like to run so you can start out by running yourself around the field until I tell you to stop." Frisch's club finished second again in 1936, losing to the Giants, and slipped to fourth place the following year. The colorful Gashouse Gang years were largely over and Frisch's managerial years in St. Louis ended after the 1938 season. Frisch left the playing field in 1939 for the radio booth, doing play-by-play broadcasts for the Boston Braves. He returned to the field the following year, and managed the Pirates for seven seasons. His Pittsburgh clubs finished in the first division five times, but were never a serious threat to capture a pennant. The Pirates finished in second place only in 1944, but even then by a distant 14.5 games behind the Cardinals. Frisch's years with the Pirates were remembered for his antics, mostly his umpire-baiting. He was thrown out of one rainy game for going out to home plate carrying an umbrella to protest an umpire's failure to call the game. On another occasion he was photographed giving an umpire a sweeping bow in sarcastic protest after the umpire cleared the Pirates bench. There was the time when Frisch was coaching at third for his Pirates. Cubs' third baseman Eddie Stanky interfered with one of Frisch's players by giving him "the hip" as he was trying to score a run on the following hitter's extra-base hit. The lead Pirates runner was knocked sprawling and was awarded the run because of Stanky's obstruction. As the hitter ran out a triple, he slid into third base from one side and Frisch, determined to react to Stanky personally, slid into the bag from the coach's box. Umpire Jocko Conlan called the runner safe and immediately ejected Frisch. Frisch left the Pirates after the 1946 season, and spent the next two years living in his beloved home in New Rochelle, tending to his garden when not doing the radio play-by-play of Giants' home games. Frisch was a hit on the radio despite his high-pitched voice and lack of training as a broadcaster. Fans encountering Frisch loved to imitate his radio style, especially his long-time managerial lament, "Oh, those bases on balls." He returned to the field in 1948, coaching for the Giants. In 1949, Frisch coached for Leo Durocher's Giants until June 10, when the Cubs hired him to replace Manager Charley Grimm. Frisch returned to managing against the advice of his wife and many of his friends. He admitted later that he took the job because he loved being a manager, although he realized the Cubs were a last-place team with no immediate hope of improving. They finished last in 1949, in seventh place the next year, and were last again in 1951 when Frisch was fired on July 21. According to first baseman Phil Cavaretta, who replaced Frisch, the firing was triggered when Cubs General Manager Wid Matthews saw the disinterested Frisch sitting in the dugout reading a book during a game. As a player, Frisch had a lifetime average of .316 in 2311 games with 2880 hits and 1244 RBI's. He led the National League in stolen bases in 1921, 1927, and 1931 for a career total of 419, an excellent number for the era in which he played. Frisch set several fielding records for National League second basemen, and various batting and fielding marks in his 50 World Series games. He was elected to the National Baseball Hall of Fame in 1947. 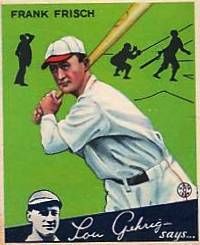 Frisch was a popular figure over and above his prowess as a player. He had a robust sense of humor and was constantly exchanging jokes and ribald stories with fellow baseball men, umpires, and sportswriters. He maintained his home in Westchester County, New York, for many years after he left the Giants in 1927, and he was often accused jokingly of attempting to get thrown out of games when his team visited New York so he could spend more time at home. Frisch carried on a continuing series of practical jokes with other managers. When Casey Stengel was hit by a car while managing the woeful Boston Braves, he wired Casey: "Your attempt at suicide fully understood. Deepest sympathy you didn't succeed." Giants manager Mel Ott told of visiting Frisch in the Pirates clubhouse before a World War II game, hoping to get a peek at Frisch's blackboard detailing how the Pirates planned to pitch to Ott's Giants. Ott reported, "We had a nice social visit but don't think for a moment that I got a look at that blackboard. Frank had pulled a dark shade over it and every once in a while he would look at it, wink at me, and go right on talking about something else." Despite his rugged persona, Frisch had genteel interests off the field. He enjoyed frequenting fine restaurants and reading good literature. He was an enthusiastic gardener whose roses were a constant source of pride. And he was a classical music devotee. But, as he grew older, he was often a gruff, old-school observer of the playing styles of a later generation of ballplayers. For example, he referred to spring training as "a country club without dues. "6 It is not difficult to imagine his reaction to the changing baseball strategies and the players' on and off-field customs and mores that he did not live to see. He was able to honor the memories of some of his teammates when he joined the Hall of Fame's Veterans Committee in 1967. The outspoken, persuasive Frisch became a leader on the committee, and sponsored six old Giants and Cardinals into the Hall. The analyst Bill James called them "simply appalling selections." They included Frisch's double-play partner Dave Bancroft, Giants first baseman George Kelly, and St. Louis pitcher Jesse Haines. Later historians judged them to be among the least deserving players ever elected. Frisch married Ada A. Lucy in 1923. The couple had no children. After Ada died in 1971, Frisch married Augusta Kass the following year. He died in Wilmington, Delaware, on March 12, 1973, after an automobile accident while he was returning home from a Veterans Committee meeting in Florida. Bob Broeg, Super Stars of Baseball. The Sporting News, 1971. Peter Golenbock, Wrigleyville-A Magical History Tour of the Chicago Cubs, St. Martin's Press, 1996. Frank Graham, McGraw of the Giants, G.P. Putnam's Sons, 1944. Bill James, The Politics of Glory, Macmillan, 1994. Bill James, The New Bill James Baseball Historical Abstract, The Free Press, 2001. Total Baseball, 7th Edition, Total Sports Publishing, 2001. 1. Although Frisch used 1898 as the year of his birth, New York City birth records, Social Security death records, and US Census records indicate that he was born in 1897. 2. John McGraw, quoted in Bob Broeg, Super Stars of Baseball (St. Louis: The Sporting News, 1971), 89. 5. Bill James, The New Bill James Historical Baseball Abstract (New York: Free Press, 2001), 493.